Heated Leather Seats, Navigation, Sunroof, Back-Up Camera, Panoramic Roof, Premium Sound System, WHEEL LOCKING BOLTS, Satellite Radio, DRIVER ASSISTANCE PACKAGE, WOOD/LEATHER STEERING WHEEL, BURL WALNUT WOOD TRIM, WHEELS: 19 AMG® MULTI-SPOKE ALLOY, PREMIUM PACKAGE, Turbo Charged, GINGER BEIGE/ESP®RESSO, LEATHER UPHOLS... FLOORMATS, PANORAMA ROOF. SL 450 trim, designo®® Diamond White Metallic exterior and Ginger Beige/Espresso Brown Leather interior. FUEL EFFICIENT 28 MPG Hwy/20 MPG City! Warranty 4 yrs/50k Miles - Drivetrain Warranty; AND MORE! 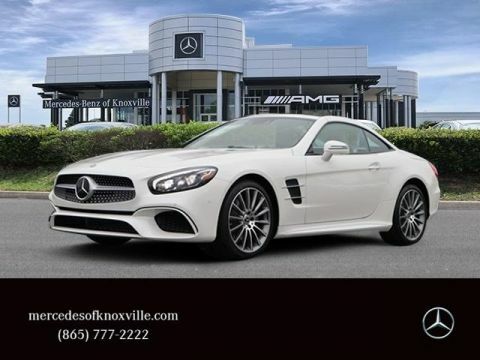 KEY FEATURES INCLUDE Navigation, Panoramic Roof, Back-Up Camera, Turbocharged, Premium Sound System, Satellite Radio, iPod/MP3 Input, Multi-CD Changer, Onboard Communications System, Convertible Hardtop, Remote Engine Start, Dual Zone A/C, Smart Device Integration, Brake Actuated Limited Slip Differential. MP3 Player, Steering Wheel Controls, Rollover Protection System, Electronic Stability Control, Heated Mirrors. OPTION PACKAGES PREMIUM PACKAGE: Active Multicontour Seats w/Massage, KEYLESS GO®, Heated & Active Ventilated Front Seats, Grey-Painted Brake Calipers w/Perforated Discs, AIRSCARF® Neck-Level Heating System, HANDS-FREE ACCESS, Active Parking Assist, Electronic Trunk Closer, DRIVER ASSISTANCE PACKAGE: Speed Limit Assist, PRESAFE Brake w/Collision Mitigation, Active Brake Assist w/Cross-Traffic Function, Active Distance Assist DISTRONIC, Active Steering Assist, BAS® PLUS, PRESAFE PLUS, DISTRONIC PLUS® w/Steering Assist, PRESAFE PLUS, Active Lane Keeping Assist, Blind Spot Assist, WOOD/LEATHER STEERING WHEEL, WHEELS: 19 AMG® MULTI-SPOKE ALLOY, WHEEL LOCKING BOLTS, GINGER BEIGE/ESP®RESSO, LEATHER UPHOLSTERY MORE ABOUT US Knoxville AMG® Performance Center is Driving Performance Horsepower calculations based on trim engine configuration. Fuel economy calculations based on original manufacturer data for trim engine configuration. Please confirm the accuracy of the included equipment by calling us prior to purchase.Heated Leather Seats, Navigation, Sunroof, Back-Up Camera, Panoramic Roof, Premium Sound System, WHEEL LOCKING BOLTS, Satellite Radio, DRIVER ASSISTANCE PACKAGE, WOOD/LEATHER STEERING WHEEL, BURL WALNUT WOOD TRIM, WHEELS: 19 AMG® MULTI-SPOKE ALLOY, PREMIUM PACKAGE, Turbo Charged, GINGER BEIGE/ESP®RESSO, LEATHER UPHOLS... FLOORMATS, PANORAMA ROOF. SL 450 trim, designo®® Diamond White Metallic exterior and Ginger Beige/Espresso Brown Leather interior. FUEL EFFICIENT 28 MPG Hwy/20 MPG City! Warranty 4 yrs/50k Miles - Drivetrain Warranty; AND MORE! Navigation, Panoramic Roof, Back-Up Camera, Turbocharged, Premium Sound System, Satellite Radio, iPod/MP3 Input, Multi-CD Changer, Onboard Communications System, Convertible Hardtop, Remote Engine Start, Dual Zone A/C, Smart Device Integration, Brake Actuated Limited Slip Differential. MP3 Player, Steering Wheel Controls, Rollover Protection System, Electronic Stability Control, Heated Mirrors.